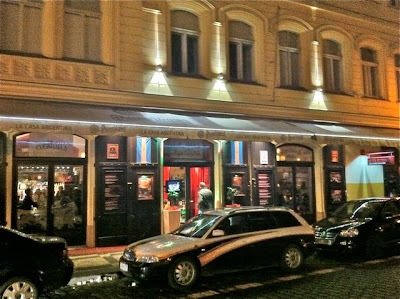 A lot of people say they grill excellent South American steaks at La Casa Argentina. Even me. I last went almost four years ago, wrote about it, but I had no desire to return to this bustling Old Town establishment. 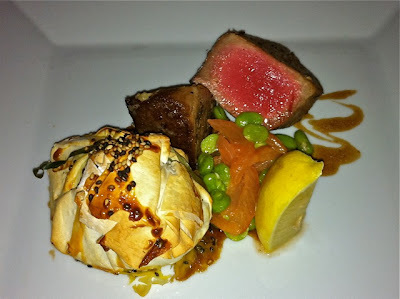 While I had fond memories of the beef, I didn't like the service or the prices. 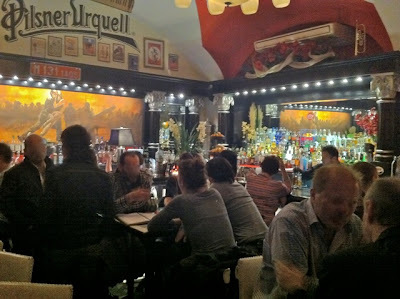 El Barrio de Ángel became my South American steakhouse of choice. 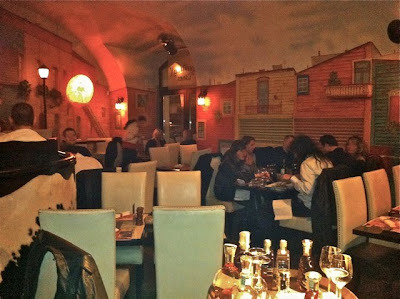 Given a few years, a lot can change in a restaurant, so I thought I'd give La Casa Argentina another try. The interior is the same. You walk in and usually find the small bar area packed in the evening. The design is a Disneyesque conglomeration of cartoonish South American kitsch. There is a separate room called "Salon Iguazú" which feels like a misty jungle scene. For this report, I started using the camera on my new iPhone 4. It does pretty well in good light, but in low light, the pictures can get grainy, especially if you don't want to shoot a flash in people's faces. A point and shoot is still better in those situations. We went past "Salon Iguazú" on the way to the back because My Friend is a militant smoker. 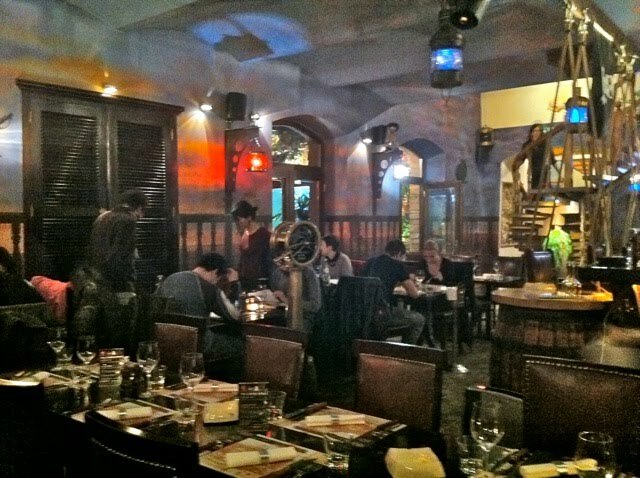 There back dining area called "Salon Puerto La Boca." 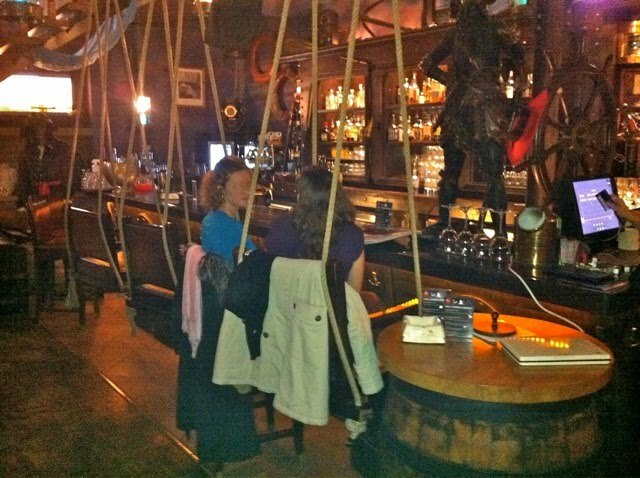 It is one of my favorite parts of the design, with parts from an old ship and swinging bar chairs that hang from ropes. As we were seated, we witnessed a large party having a heated dispute with a waiter and manager over whether they should be in the smoking area. They didn't want to be, but the restaurant was full and there was no other place available. I started with a .4 liter glass of Pilsner Urquell (80 CZK). 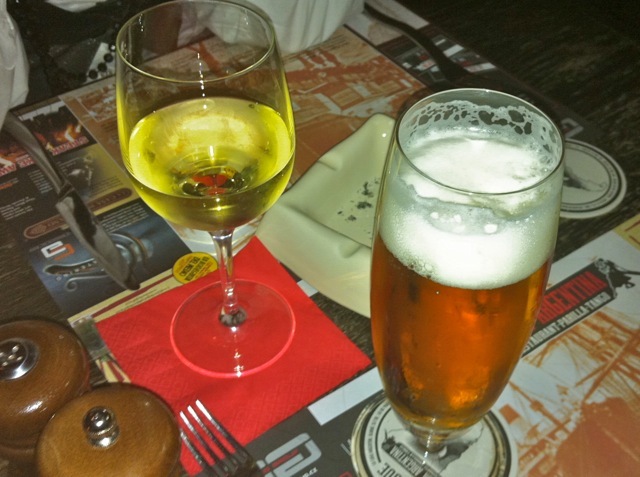 My Friend had a .1 liter glass of the house white wine (99 CZK). That's expensive, even for the center. 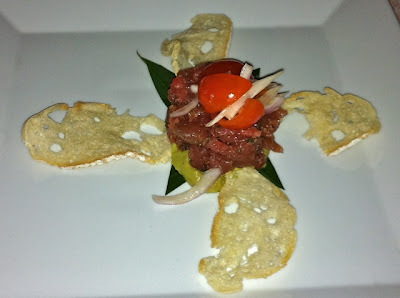 My Friend had tuna tartare avocado puree with lemon caramel and baguette chips (190 CZK). 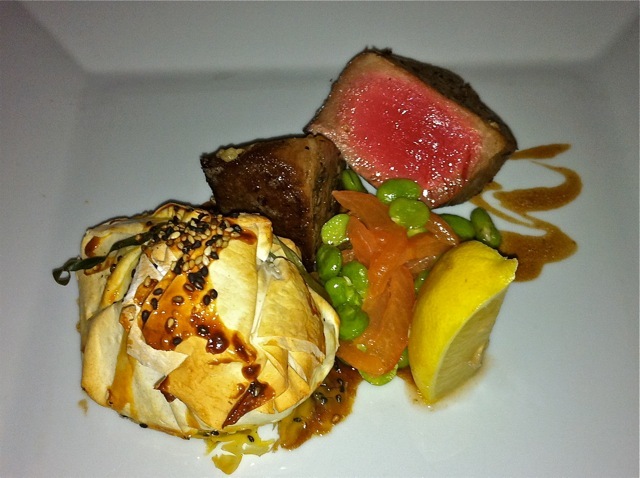 The tuna was fresh, with an almost creamy texture and mixed with a tangy sauce. It was a very small portion for the price. 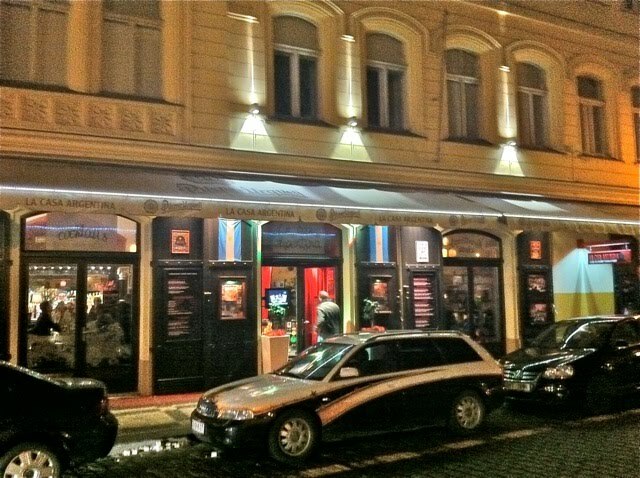 I had the two Argentinian empanadas (178 CZK). 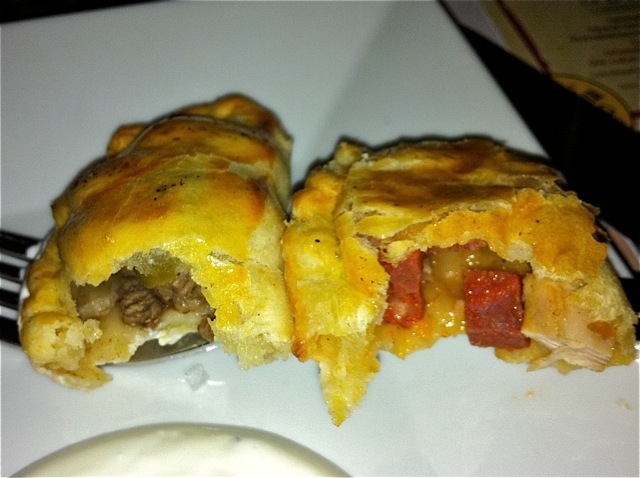 One pastry was filled with chicken and chorizo, and one had small chunks of beef and chimichurri. 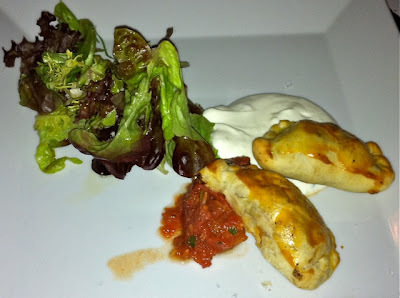 The empanadas were golden and crispy on the outside and moist inside. The meat was a little chewy. I preferred the chicken empanada with its stronger, smoky flavor. But each was gone in two bites, and I thought it rather shameless to charge as much as they do for these tiny tastes. There was a long wait before the next round of food came. 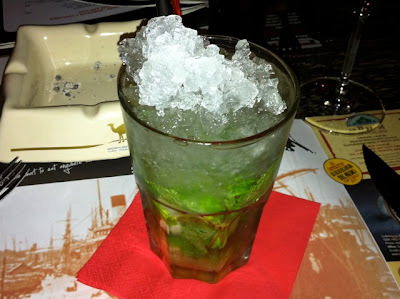 During this time, I ordered a mojito (159 CZK). It was one of the worst I've had in a long time. The glass was small, it was jam-packed and overflowing with ice, and it was poorly mixed. There was very little lime and the sugar was almost all at the bottom. It tasted like lightly sweet soda water. It was a crime against sobriety. 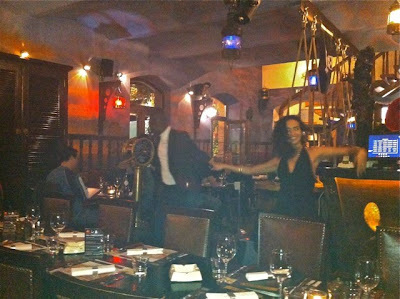 Also while we were waiting, we watched two professional dancers spinning around the restaurant, but only briefly. The CD started skipping, so they had to stop. For a main course, My Friend went for the tuna fillet with red wine sauce, tomato concassé, green beans, and mashed potatoes in sesame paste (415 CZK). The tuna was properly rare in the middle, but unnaturally red. Since it was such a thick chunk, it was dense and dry on the outside. The sauce was nice, but there was too little of it. The potatoes were a disaster. The arid, crumbly spuds were encased in a dry crispy shell. We both hated it. I ordered the 200 gram Argentinian Aberdeen Angus rib eye steak (280 CZK). The waiter warned me that it was small, but I said that was OK, I wasn't so hungry. Indeed, it was not large, but the steak was excellent. It was tender, smoky, juicy, and cooked medium rare as requested. I chose the pepper sauce to go with the beef. It was surprisingly bland. On the side, I ordered the "BBQ crinkle wedges." (65 CZK) Adding a spicy, salty seasoning was what made them "BBQ." They were hot and crunchy reconstituted, shaped potatoes. Good, but not a cheap addition. I more or less end where I began. The service was somewhat better than I remembered, but still not great. It was sporadic, hurried, and impersonal. 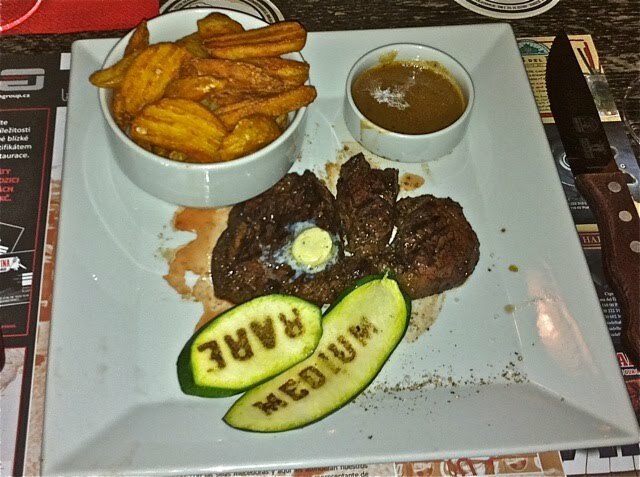 The steak was very good, but the prices for what you get really made my head spin. In general, La Casa Argentina is not a place to go if you are looking for value. I was hoping I'd find it, but I paid the price. I have dined here several times over the last 4 years and have never really had any issues with the service, although in almost every review I have read its been flagged up as a problem. I found the staff to be accommodating when it came to booking tables too. 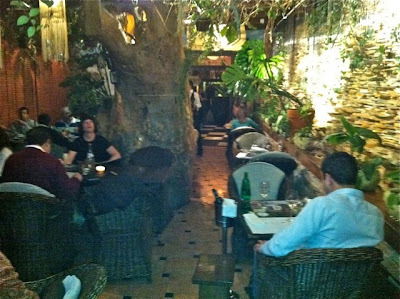 Often I would stop in when passing by and be allowed to wander through the restaurant and pick the exact table I wanted. Usually one offering a view of the parilla. The only negative is that quite frequently I have found that the exact bottle of wine you order is 'currently unavailable' but usually the waiter can have the sommelier recommend something similar. You wont be shocked to find its usually several hundred crowns more expensive. It may be that im unlucky, but I would really hate to think that this is all an elaborate ruse to up sell. with the wine I have to agree, we asked for wine and we got a different one, of course more expensive more, but we dint know, found out on the bill!! Then we were charged 4 coffees that we even didnt have. We were only two people. Plus we had to wait for the food for more than 1 hour and half. All to together: Not worthy! !